Just recently during one of my coaching sessions one of my VA coaching clients asked me to help figure out how to help her earn more money and work less time. I mean, after all, isn't this the dream of any entrepreneur (okay maybe not everyone, but most people I know anyway)? If you haven't read Tim Ferriss' book The 4 Hour Work Week I highly suggest you take a look. Don't we as virtual assistants constantly talk about how we are going to help our clients get time back for themselves? Well what about us? Are we not entrepreneurs ourselves? Don't we need to start thinking like an entrepreneur? I know that as a mother to four I have to find creative ways to make more money in less time because I don't have an unlimited amount of hours a day to work like my husband does. My work day ends at close to 1:30pm as I have to start collecting my kids and that's when stage 2 starts. Stage 2 is "Reese the mommy" and I am full on - every day. Lunch, homework, laundry, one-on-one time, play-time, dinner, bath time and then bed. Between laundry, cooking, and spending quality time with my kids I just don't have the ability to work 8 hours a day like some of my counterparts (have you ever seen the laundry room of a 6 person family? I should post a picture just for fun). This is why I knew the only way I was going to earn great money was by thinking out of the box. 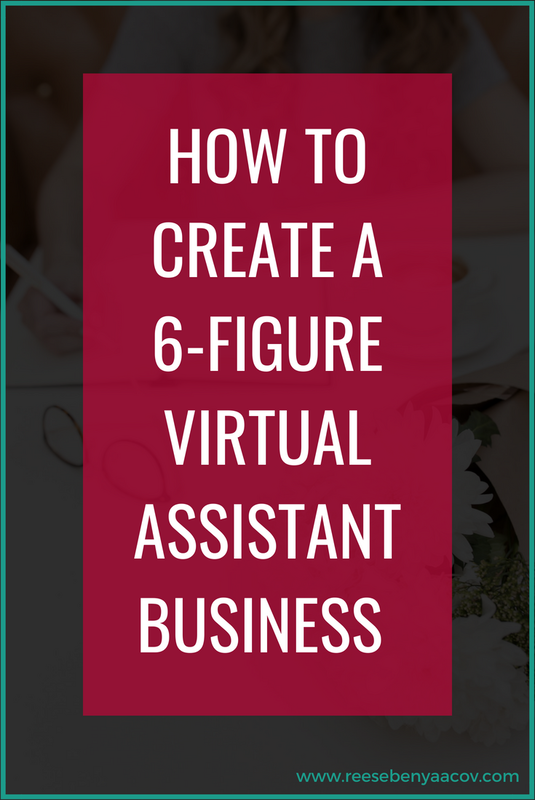 In the video below I will explain how I started working as a virtual assistant and very quickly realized that due to the amount of work on my plate I needed to hire a team to help support me and my clients. Making some changes in my business enabled me to earn 6-figures. Sit back, relax and watch the video below. Leave me a comment below and let me know what questions you have.